I think this is a Brant’s Cormorant (but it could be Double-crested…hard to tell in this photo…there were more Brant’s than Double-crested that day). Sally (my daughter) and I observed a lot of this behavior off the cliffs at La Jolla Cove in southern California when we visited the end of February. I though at first it might be some kind of mating ritual, or territorial display, but after inquiring of “someone who knows better”, I now know that the bird is just wetting itself. Yes that sounds a bit off-color, but that is what my expert said, and I don’t know how else to describe it. The Cormorants get cold in the cool waters of Southern California, and have to come out onto the rocks to warm up and dry off. 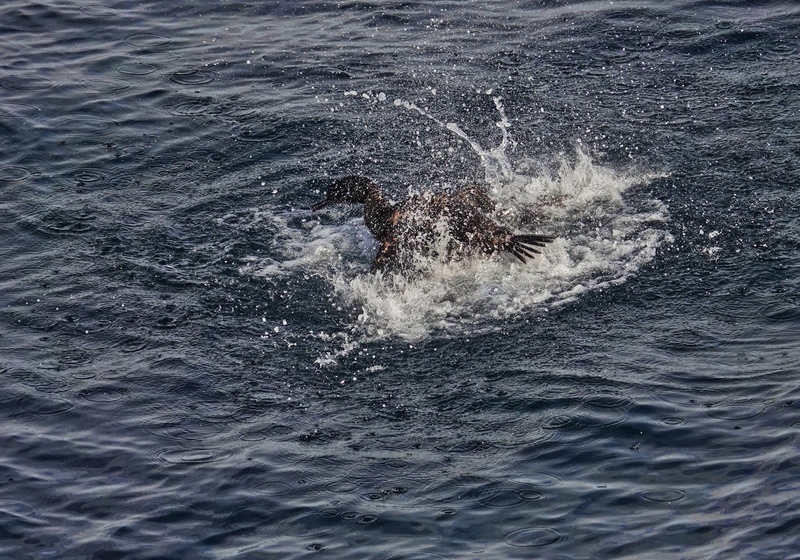 Then, when they get back in the water with their dry plumage, they are too buoyant to dive after fish, and have to wet themselves down…which they do by this vigorous splashing. The splashing gets water into the back feathers without their having to submerge. Simple enough, and makes total sense, when you know. Sony RX10iv at 600mm equivalent. Program mode with my custom birds in flight and action modifications. 1/1000th @ f4 @ ISO 125. Processed in Polarr.